One day my mother and I were discussing sight and what I would look at first if I got it back for a limited time. My answer was quick and firm. I’d look at the moon, the stars, at famous paintings, at pictures in magazines and books I always heard so much about. My mom started to cry. The answer was supposed to be that I would look at her, at my father, at my brothers and sisters, at all the people I loved and whose faces I couldn’t see. I was truly sorry I had hurt her, and at the same time I was perplexed. I knew what my mother and father and brothers and sister looked like. I knew how tall they were, how big or small, the feel of their skin, and the length and texture of their hair, what they sounded like, what they enjoyed for breakfast, and their favorite hobbies and pastimes. Why wasn’t it obvious that I would want to learn about things I had almost no knowledge about and to engage in an experience that eluded me? Pictures have always seemed magical. How could someone with paint and a brush capture a smile that has captivated the world? How can people looking at a statue see the weight of the world on President Lincoln’s shoulders? What did the astronauts see from space that made them realize how fragile is the planet on which we live? How can light on paper preserve my grandfather’s strong and sturdy body when he was thirty when the man I knew was stooped and found it hard to walk? A picture may be worth a thousand words, but that doesn’t mean a thousand words can fully capture a picture. My guess is that words can no more describe a picture than they can describe the sound of an orchestra or the beauty of a human voice singing on-key and with emotion that can almost break a heart. So when pioneers say they want to join with the blind in putting pictures in our hands, we are excited, anxious to join with them, and committed to expanding our experiences into all of the areas that understanding pictures might open: easier ways to comprehend science, to observe technology, to participate more fully in the appreciation of art that has been closed to the blind. John Olson is a photographer who became known as a result of his work taking photographs during the Vietnam War working first for Stars and Stripes and later for LIFE magazine. His pictures transformed an abstract battle in what too many of us thought of as a battle way over there in Asia into a life-and-death conflict between human beings who were as close as our kitchen table. 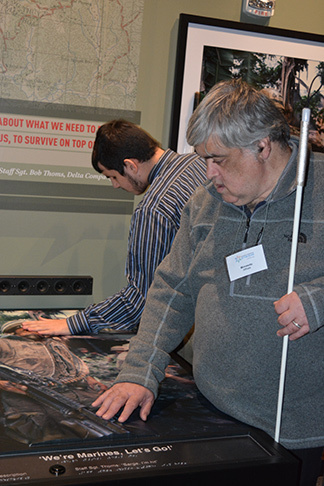 John’s success in pictures made him wonder how the blind experienced life and whether it could be enhanced by having access to something that had meant so much to him. So it was that in 2008 he created 3DPhotoWorks, a company with the mission of converting pictures into tactile representations blind people could feel and enjoy. On January 30, 2018, a first-of-its-kind exhibit was held at the Newseum in Washington, DC. Pictures that started Mr. Olson’s career by capturing dramatic scenes at the Battle of Huế City during the Tet Offensive in 1968 were shown to the blind using tactile representations and audio descriptions. These exhibits showed a Marine in battle fatigues with a belt of ammunition for an automatic rifle slung across his chest, a body covered in blankets on a stretcher, a Marine in dress uniform—different facets of the military life and experience that Mr. Olson shared as a war photographer. When touching a part of a picture, what is being touched is described, and several pictures and audio descriptions make up each display. 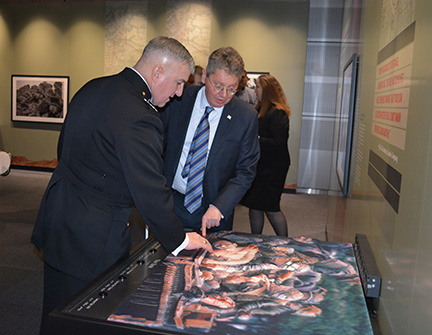 On the night of the Newseum exhibit held exclusively for the NFB, lots of excited people were touching and listening. Multiple people examining one exhibit was a problem since touching a different picture immediately halts the description of the previous picture and begins narration of the one just pressed. Dr. Maurer went back to see the exhibit for a more personalized tour. His request was that he be allowed to examine a series of pictures without the audio to see what he could determine for himself. He was able to detect a man who appeared to be wearing a belt. The man was a Marine in dress uniform with a saber in his hand, ribbons on his chest, and decorations on his collar. In another case he examined a picture of a tank. He could tell it was a tank and could find the tread on which it rolled, but because the door of the tank was on the same plane, he could not identify it. Clearly what we are seeing in these works is experimental and raises some good questions. What can we do to make drawings that convey more through the sense of touch? What can we learn to detect through touch that we have not stimulated because trying to interpret pictures is not a normal part of our experience? Since understanding photographs seems intuitive for people who can see, is this something learned through repeated exposure, or is it something reserved primarily to those with vision? Perhaps the most important question is this: if blind people are exposed to tactile art repeatedly at an early age, is it something they can appreciate as much as people who can see? We are forging something wonderful as we explore the new frontiers of experience, learning, and making museums acknowledge our interest in things that are too often behind glass, too often elevated above where we can reach, and too often separated by a rope or other barrier, the message being "do not touch." We are working to learn the boundaries of touch, expand our knowledge about how to construct tactile art to make the most of touch, and convince museums and other places that display interesting and historic information that the blind want and can benefit from it. Through our partnership with John Olson and 3DPhotoWorks, we will make substantial progress in enriching the lives of blind people who want to know more than what is delivered through the spoken word. Together with the work we are doing with science, technology, engineering, and math, we will increase the ease with which blind students learn, increase the ability of blind workers to use drawings like their sighted colleagues, and open up fields of study which for too long have been thought off-limits to the blind. In this investment of our time and treasure, the Federation will most certainly win because anything we do will bring more information into the hungry and curious minds of blind people.